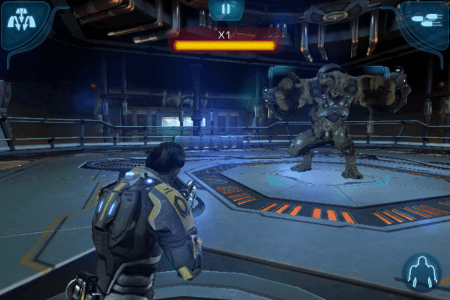 Mass Effect 3 is a game so massive that, much like blockbuster movie releases, it’s getting its own licensed video game for the iOS platforms. 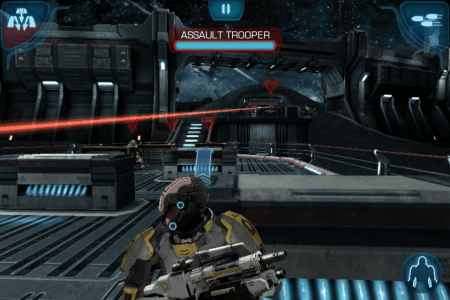 Mass Effect Infiltrator is a touch-based third-person shooter that puts you in charge of a Cerberus agent who turns against the diabolical, conspiracy-ridden enterprise. With Iron Monkey Studios, the developers of the award-winning iOS rendition of Dead Space, in charge of the game and the high production values associated with EA and Mass Effect, is this one of the rare licensed games that plays like a charm, or should it be left in the grisly tentacles of the Reapers? There is no “BioWare” tag associated with Mass Effect Infiltrator. If there had been, perhaps players would have felt a little duped by the promise such a tag brings with it. The story is as basic as it gets: you play as Randall Ezno, a Cerberus agent with cybernetic implants who gathers up aliens for scientific testing. A charmer, in other words. When Randall’s partner back at the Cerberus base is abducted by her own company for testing, he gets a little angry and decides it’s time to blow up the joint and its malevolent Director with the help of the Human Alliance. That’s it. A basic story isn’t always a bad thing, and in the few moments of dialogue of Infiltrator the writing can actually be compelling, but for the most part, as you advance through the base, you’ll mainly be hearing menacing one-liners from the aforementioned Director. He’s evil see? Evil people say mean things while you wander through their corridors, and they do it a lot. As such, the game becomes a bit of a grind leading into the closing chapters of the story. On top of that, there are some bits of story that don’t really seem to make sense within the established world of Mass Effect. In the very first mission, I was confused to be fighting Turian Soldiers and Geth Snipers who appeared to be on the same side. Not really what I’d call lore appropriate. The ending is left a little open-ended, but to its credit Infiltrator tries for the same tone of loss and despair as Mass Effect 3. Though it does not come close to reaching those heights in terms of pulling at your own heartstrings, it does a good job of showing Randall Ezno’s pain at the tragedy that has befallen him. Mass Effect Infiltrator should feel familiar to play for anyone who has played the console Mass Effect titles. There’s crates, walls, and conveniently placed benches to be used as cover while enemies pour forth from various doors in an area. From your “I’m behind the safest workbench in the galaxy!” perch you can shoot, use biotic abilities, and cloak to move around undetected. Of course, converting shooting mechanics from the console versions and attempting to implement them with touch-based replicas of analogue sticks would have been both difficult to design well and frustrating to play, so I’m happy to say that Iron Monkey opted for a touch-based shooting mechanic instead. Players will tap the enemy they wish to target and then, using the recently maligned touch-based analogue-stick-wannabes, they can aim at a certain part of the target’s body to do extra damage (usually the head). Ezno can switch between assault rifles, snipers, and shotguns to help in his vengeful quest, and can use the biotic abilities Pull and Leash to suspend enemies in mid-air and throw them about like useless puppets. Personally, I found Pull more effective, as it can rip the shields off of the annoying Cerberus riot troops and tear snipers out of their perches, and at later stages you can target multiple enemies with it, so you can do both the shield and sniper pulling in a manner that’s adaptive to whatever battlefield you’re on. 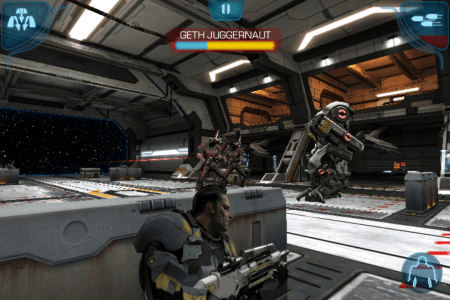 Infiltrator features a good deal of enemy variety. At the expense of explaining why others gunning for Cerberus aren’t working with you (you’d assume once you and the escaped prisoners realized you were both shooting the same people that you’d fight together), you’ll never know whether there’s a Krogan battle unit, Geth juggernaut, Asari prsioner, or sniper team waiting to blow your head off just around the corner. So with all the stuff it’s throwing at you, it’s good that the game features a robust cover system. In fact, I found moving from cover to cover in Infiltrator to be far more effective than in Mass Effect 3. Sure, it can be weird that Ezno does massive somersaults to travel between distant pieces of cover, but in terms of gameplay, it just works. This is where the game truly excels, and therefore it’s a shame that though these mechanics serve you well throughout the four to five hours of the game, the two boss battles involve a lot of running and gunning. Using the aforementioned, and still much maligned, touch-based analogue-stick wannabes. Based on your performance, the game awards you credits after every battle, and using those you can upgrade your armour, abilities, and weapons. It’s not the deepest system in the world, but you’ll definitely feel the results of your investments. You can also gather intel from defeated enemies and use this to either increase your Galactic Readiness rating in Mass Effect 3 or garner some additional credits. You’ll occasionally find a Cerberus scientist hidden in a room and the screen will freeze and ask, “Paragon or Renegade?” Though attempting to mimic the choices of Mass Effect games, these bear no overall consequence and so mean little. I just switched between them depending on my mood at the time. The game really could have done without this as Mass Effect is about more than binary choices. 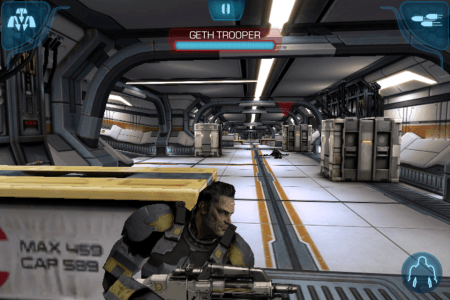 Regardless of issues, Infiltrator does a good job at being an iOS cover-based shooter, and it needs to be commended for that. Most combat arenas are challenging and fun, and the checkpointing doesn’t leave too much to be desired. 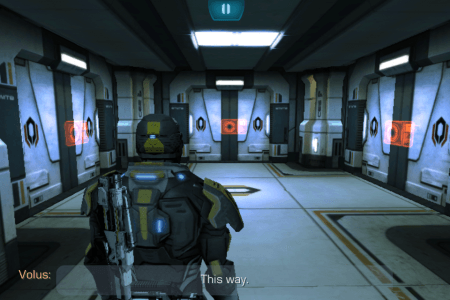 Mass Effect Infiltrator is great to look at. Though some of the environments get repetitive, the graphical fidelity always remains. It’s most definitely one of the better looking games on the platform, and, in visuals at least, it does a good job of capturing the look of the Mass Effect universe. When a game prompts you to “plug in headphones for best experience”, you know you’re in for something pretty good, and, indeed, the sound design of the game matches the visual presentation. The sounds of guns bear the necessary impact, a few good tracks are lifted from the Mass Effect games, and the voice acting, though not spectacular, does its job well. Ezno in particular really sells a tone of desperation as he desperately searches for his partner. Mass Effect Infiltrator is a good game. It has flaws with its controls when roaming about, but when you’re fluidly moving through cover, mowing down approaching enemies, it gives you a rush on par with some of the better shooters out there. You could take the Mass Effect moniker away from the story and probably not tell the difference, but the bonuses to Shepard’s campaign are substantial enough that you’ll feel like you’re helping your overall war effort even when you’re stuck on the daily commute. It may not be the most fitting companion title to BioWare’s epic finale of the Mass Effect trilogy, but it is a solid game, and worth your time if you just can’t get enough of Mass Effect or third-person shooters.